This is a Package. 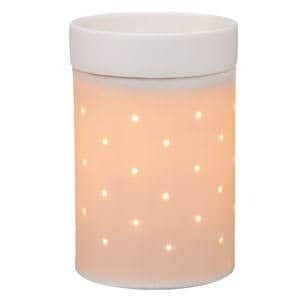 You will be able to add a wrap to this warmer when you click on Buy Now. Start your own Silhouette Collection with this simple, porcelain wamer designed to allow light to shine through its metal wrap. One Silhouette wrap is included with the purchase of each warmer; expand your collection by purchasing additional warmer wraps individually. Wraps are designed to fit over Silhouette Collection warmer only. Warmer may not be purchased separately.